Paytm Mall Maha Cashback Sale kicked off on October 22 and going to run till October 25. Here are the best TV deals that are currently available on the platform during the sale on day two. 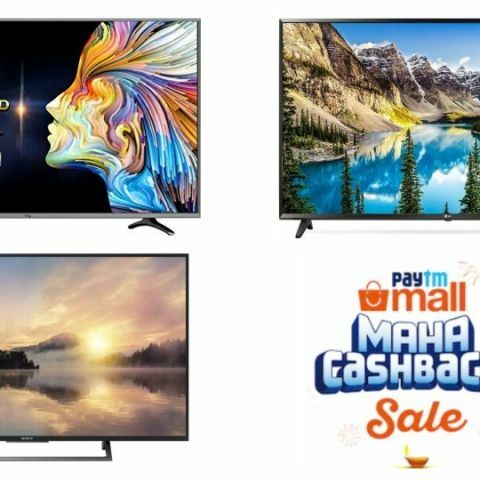 Paytm Mall Maha Cashback Sale has finally started yesterday featuring discounts and offers on hundreds of products of all major product categories. The platform is also offering 10% instant discount to buyers who will make payment through Kotak Bank debit/credit card. Here take a look at the best TV deals from Sony, LG, Samsung during the sale. The Sony 43-inch Full HD Smart LED TV comes with a built-in Wi-Fi, which allows you to connect the TV to your home network and access the internet. The TV offers a resolution of 1920 x 1080 pixels. One can get this TV during the sale for as low as Rs 35,000 (appx). View deal here. The LG 43-inch 4K UHD Smart LED TV offers a resolution of 3840 x 2160 pixels. The TV has built-in Wi-Fi that lets you connect it to the internet and download apps like Netflix, Hotstar and more. It is available on the Paytm Mall Maha Cashback Sale for Rs 44,551. There is also a no-cost EMI available along with an exchange offer. View deal here. The VU 43-inch 4K UHD Smart LED TV is available on Paytm Mall for Rs 25,002. You can get this smart TV for as low as Rs 22,500 that includes the Kotak Bank 10% discount. View deal here. The Samsung 43-inch Full HD LED TV offers a resolution of 1920 x 1080 pixels and comes with a panel size of 43-inches. During Paytm Mall Maha Cashback Sale, one can purchase this TV at Rs 28,000. View deal here. If you’re looking for a large panel, then the Panasonic 55-inch TV is something you might want to what you should look forward to. The TV is up for sale at Rs 45,592 down from its regular price Rs 56,990. View deal here. Best TV under 30k ?